Why a Stage 2 remap on this car? This Ferrari 360 has upgraded its exhaust system with the one from the Stradale version. This improves the tunability of the model. It makes it possible to have significant performance gains at both mid and high rpm with a remap. Warning light disabled for cars equipped with sports catalytic converters. Recommended extra addons for Stage2: Gearbox remap. We were very pleasantly surprised with the power gains after the remap. Usually, stage 1 remaps on this engine bring about 30-40hp flywheel. This car gained 33kW at the wheels (which is about 70-80hp flywheel) and its road performance improved significantly. 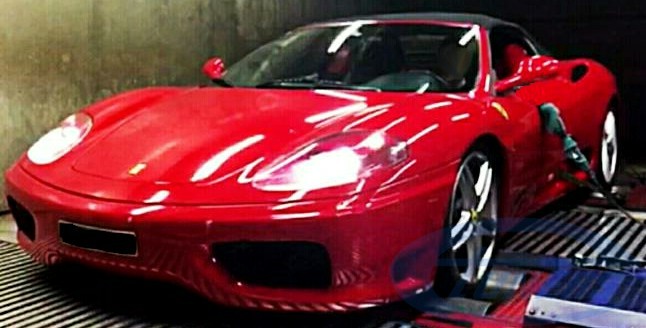 Etuners Stage 2 ECU remap results on the Ferrari 360 F1.